The team is investigating six global health policy communities — networks of individuals and organizations linked by a shared concern for a public health issue. The aim is to develop generalizable knowledge concerning why some networks are more effective than others in generating resources and attention, facilitating national policy adoption and supporting the scale-up of interventions. This specific Twitter network was created by Marc Smith tracking the keyword “gatesfoundation” among Twitter users on January [Please visit Marc Smith’s Flickr page with a full description of the process and statistic]. It shows Twitter users who have actively chosen “gatesfoundation” either as a hashtag in their tweets, retweeted a message from the @gatesfoundation Twitter account or mentioned other users’ messages. In our workshop, Marc used the Gates Foundation Twitter network as a way to contrast two different types of networks: brand networks vs. broadcasting networks. The brand network, where many Twitter users are over and over using and re-using the same keyword independent of each other, results in a tight knit community around a specific hashtag. As an example, Coca Cola or Nike have become brand networks. The Twitter network that resulted in the attached graph is clearly a broadcasting network originating from the official @gatesfoundation account. Messages and connection radiate in a star formation out to other Twitter users. Gates is mainly seen in an authoritative role: broadcasting studies, press releases, etc., but nonprofits, advocates, policy makers, etc. are choosing not to actively interact with the Foundation’s Twitter account online. The mission of Gates is to promote global public health and so they might want to use Twitter solely to educate their audience and are part of issue network conversations in other types of contexts or through other channels. Another possible interpretation is that Gates does not see itself as an integral part of the global health community – instead it relatively passively pushes out content without being part of follow-up conversations in local issue network. The overall structure of the network can potentially tell how an organization’s communication strategy is aligned with its mission fulfillment: Does the organization reach into the diverse audiences it is trying to access? Do audiences have the right information an organization aims to provide? The network also tells a story of how connected or disconnected an organization is online: If no one pays attention to the messages the Gates Foundation is promoting, the foundation needs to carefully think about its engagement strategy and effectiveness in reaching into diverse audiences. This one-time snapshot of a very short period of just one day of tweets among a limited amount of Twitter users can’t make any generalized statements about the overall communication strategy or even the Gates Foundation’s overall Twitter strategy. Recreating the map on a daily basis including world events, crisis situtions, large funding announcements, etc., will provide a more comprehensive picture over time. The Gates Foundation keyword might also be used in combination with other keywords highlighting the global health priority targets Gates is working on, such as diarrhea, new born survival, maternal health, obesity, tuberculosis, etc. The network might look very different and in fact might reveal insights into how Gates engages online in specific issue networks. This snapshot of Twitter messages cannot make any statements about the content of the tweets. Do retweeted messages show endorsement – based on the mere fact that people were willing to share? Or do they retweet and add their own negative/positive comments to the original message? A deep dive with the help of natural language processing or other types of content analysis are necessary to make a statement about the sentiments within different parts of the overall network is necessary. 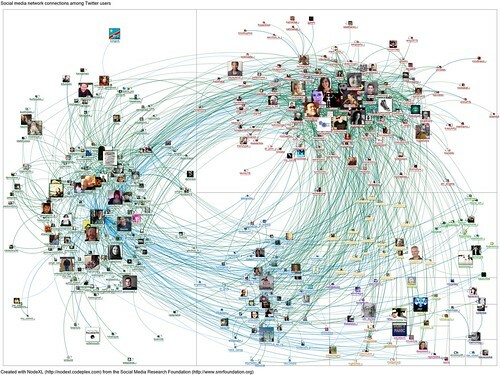 This week, Marc Smith, Chief Social Scientist at Connected Action and a social media researcher at the Social Media Research Foundation will teach a two-day Social Media Network Analysis workshop with NodeXL at Syracuse University. I received support from several departments at the Maxwell School, iSchool, Engineering school and our NSF Advance Institutional Transformation grant to organize this event and am very grateful that Marc is willing to travel to Syracuse during this time of year! So far 25 academics have signed up, among them faculty, postdocs and PhD students from the participating schools on campus. I will speak and lead a workshop on social media network analysis at Syracuse University on the 19th and 20th of January, 2012. Ines Mergel is my host. Prof. Mergel is Assistant Professor of Public Administration, Department of Public Administration and International Affairs, and a Senior Research Associate at the Center for Technology and Information Policy at the Maxwell School of Citizenship and Public Affairs, Syracuse University, NY. 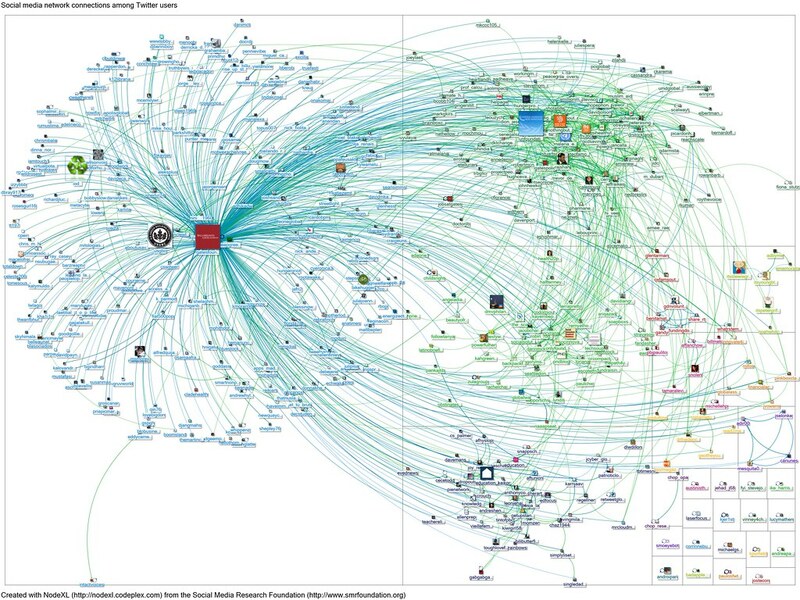 I will speak about the patterns we are finding in the data collected and analyzed by NodeXL. My personal research interest in this workshop is to analyze observable social media tactics of government organizations and triangulate the data with qualitative data I collected from interviews with social media professionals in government. Social media network analysis can help to gain insights into the reuse of information published by government agencies, the structure of their followers and the pathways messages take through a Twitter or Facebook network. My idea is to trace impact and effectiveness of government engagement on social media applications beyond quantitative numbers of followers or messages. David Lazer (Northeastern & Harvard University) and I have just posted a new working paper titled “Tying the network together – Evaluating the Impact of an Intervention into the Advice Network of Public Managers“. It’s up on the Social Science Research Network for comments. We are in the process of making some substantial changes to it, but would love to hear your feedback! Networks are often see as emergent and self managed; and yet much of the research on networks examines how networks affect the effectiveness of systems and individuals. Is it possible to intervene in the configuration of a network to improve how it functions? Here we evaluate the impact of an intervention to change the array of relationships connecting a set of distributed public managers—State Health Officials (SHOs). SHOs were brought together for a one week executive educational program near the beginning of their tenures. This paper evaluates the question as to whether this program had long run effects on the ties among SHOs. Using a combination of survey and interview data, we find that there is a substantial effect on the probability of ties between individuals that attend the program together, relative to individuals who attend the program in different cohorts. Given recent findings that highlight the importance of interpersonal networks in the effectiveness of individual managers, this suggests a potential role for interventions to improve the efficiency of dispersed, public sector manager to manager networks. (I posted this on the Netgov blog and also on the Socnet list server earlier this weekend). Together with Jana Diesner, CMU, and Matthias Meyer, WHU, I have started to collect information on social network analysis software packages and libraries. In order to be able to make a selection from a larger pool of tools, we searched the literature and the Web for archives of tools that are widely accepted. Our goal here was to compile a systematic and (to an extent) exhaustive list of tools along with their main features, application areas and possibilities for interoperability across tools. We failed in this effort. Clearly, there is a plethora of listings of some of the tools according to more or less explicitly stated categorization or selection criteria out there (e.g. INSNA and the chapter by Huisman and Duijn (2005) on Software for Social Network Analysis). However, none of these lists seemed complete or up-to-date to us. We noticed that compiling our own list leads to the exact same problems, and we think we are not the only ones who went through this process. We thought this might be a good case for putting the wisdom of crowd idea into action in the social networks community. Our rationale here is that no single Web editor or researcher needs to carry the burden of building and/or maintaining such a collection, but collectively this goal can be achieved with very little individual effort. Wikipedia has an elaborated site on Social networks (the Social network analysis site is automatically redirected there). We started to expand the network analytic section by adding a table – which was moved by the community within a day to a new page now called Social Network Analysis Software that allows everyone to add a tool along with a URL, short description, unique feature, platform it runs on, and price. We hereby invite the social network community members to add their tools and/ or to edit/ fill some of the cells in the table. Note, the present structure of the table is a suggestion, and can be modified by anyone. Potentially, this table and the references associated with it might grow -in this case we might move the table to a new page that will be linked from the current page. If you have trouble working with the Wikipedia Table you can also send your information to Jana and we will integrate it into Wikipedia. We are looking forward to the collective results!